picture #1606 on this site, shows the real thing. 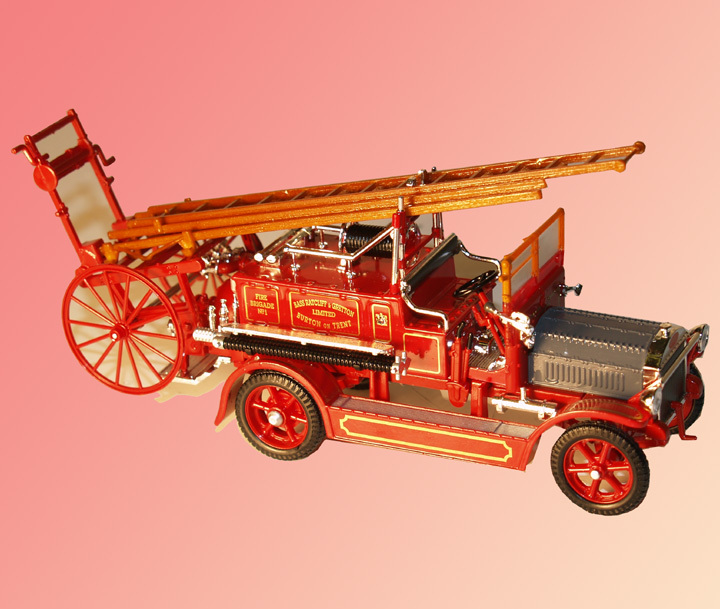 Produced by Yatming Models and sold for just over ten pounds (20 US$) it has amazing detail. Even the screws which hold the radiator header tank to the radiator core are present! Everything from the pump gauges to the CTC extinguisher are reproduced so accurately. Having spent many days polishing the brass on the real thing the chromed brass on the model does look tempting! except this one should'nt take as long to keep polished. Added by Pete Matten on 24 July 2008.
be in the shops in August/Sept?.It looks brilliant mate. Added by Pete Matten on 06 August 2008. Thanks for putting it on - and filling in the history. Added by Pat Rivers-Bowerman on 11 September 2008. To the model collector this was well worth the wait, the detail and the cost of this 1st in the series of three British fire models being put out by YatMing is really out standing.I've just got the 2nd to be released, its of a 1934 Leyland- FK-1 and again a must for the any collector, the detail is perfect. Added by Pete Matten on 11 September 2008. Added by Rob Johnson on 08 November 2017.